The Chess Merit Badge has quickly become one of the most popular badges in the Scouts BSA merit badge catalog, with more than 170,000 Scouts earning the badge since it was introduced in September 2011. Out of the 130+ badges available, the Chess Merit Badge is undoubtedly one of the most popular non-required badges. Check out the Scouts BSA website for more information! Photos may be taken at these workshops by a Chess Club photographer and used for marketing purposes. The Scouts BSA strives to instill in young people the principles of integrity, character, responsibility and leadership - preparing them to make ethical and moral choices throughout their lifetimes. The Saint Louis Chess Club prides on its mission to provide a quality, dynamic program of learning and adventure that builds critical thinking, forward thinking, and proper sportsmanship in young people. Day typically runs from 10 a.m. - 4 p.m., with a half-hour lunch break (lunch not provided to children). Earn your chess merit badge in a one-day workshop. 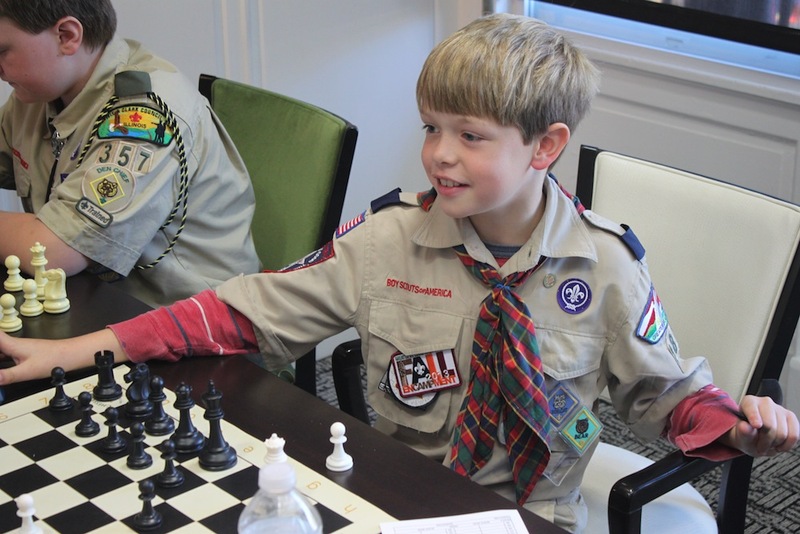 Meet other scouts interested in chess. Learn from the best, at an internationally recognized chess facility. Learn about the scope of chess in the world today, find resources to improve your game, and find out about how you can participate in chess competitions, classes and activities. Earn your Scouts BSA Chess Merit Badge! The workshop is free of cost to any scouts looking to fulfill the merit badge requirement. Not open to Scouts who have already earned the badge. Basic knowledge of chess rules is strongly recommended. Transportation and lunch not provided. Snack will be provided by the STLCC; parents are advised to report possible allergens. Register before the event at 314.361.CHESS (2437). If you're unable to attend this camp in person, you can locate a certified Merit Badge instructor by visiting the Scouts BSA website. Simply click this link and search for "chess" in the Merit Badge Counselor directory. There are a number of instructors in the greater Saint Louis area that will help you fulfill your requirements. 1. Discuss with your merit badge counselor the history of the game of chess. Explain why it is considered a game of planning and strategy.